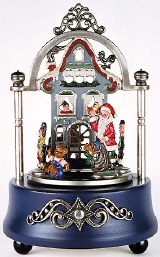 For collectors of music boxes, these motifs are a valuable and extraordinary pieces to build up their collection and a perfect present! 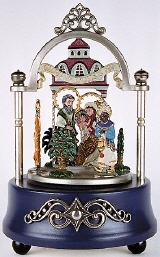 Depending on the motif, its body is made of metal or wood and plays the loved melody in a very good sound. The clockworks have 18 notes and are produced by the leading manufacturers of mechanical works world-wide. 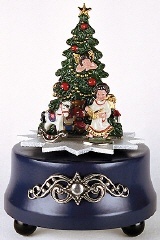 Each figure, the scenery and the ornaments are completely made by hand. This artistic work cannot be done by any computer or robot. All articles are made from 93 % pewter according to DIN (German Industrial Standard) EN 611-1. This is a high quality material and even allowed for use in construction of food containers. We do not add any lead for the pewter-alloy or the colours; for the health of our employees, our customers and environmental protection. 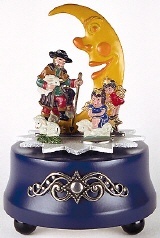 The melody played is “Guter Mond, Du gehst so stille” and has about 15.5 cm in height. The man in the moon turns on a white star and watches over little sheeps. Even some angels listen for the well-known melody. The Three Kings turn around Maria, Josef and Christ Child and bring along valuable presents. The famous melody played is “Silent Night”. The height in total is approximately 20 cm. 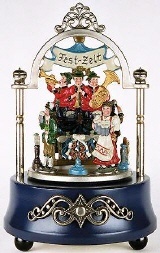 It is a scenery like at the famous Munich Oktoberfest: The music plays “Ein Prosit der Gemütlichkeit”. The waitress keeps on bringing cool beer in litre beer mugs and fresh pretzels and veal sausages are typically eaten. Who does not remember the children's shining eyes, standing in front of the lightened Christmas tree not able to wait any longer until unpacking their presents. This mood is supported by the melody “O Du Fröhliche”. Santa announces the giving out of Christmas presents and all children follow him. What kind of presents did he bring with him? The teddy bear, a little train and some more surprises. The suitable melody played is “Vom Himmel hoch...”.